British Western Red Cedar Feather Edge Cladding is a cost-effective way to give a building a rustic look an has attractive knots . British Cedar Tongue and Groove cladding is creamy in colour and quite knotty compared to the Canadian Cedar. British Western Red Cedar is quite knotty and has a pale-yellowy colour. British Western Red Cedar Rainshield Cladding is knottier than the imported Cedar and more yellow in appearance. British Cedar Waney Edge Cladding is quite knotty and features one edge still with bark for the ultimate traditional look. British Western Red Cedar is a very attractive cladding board. 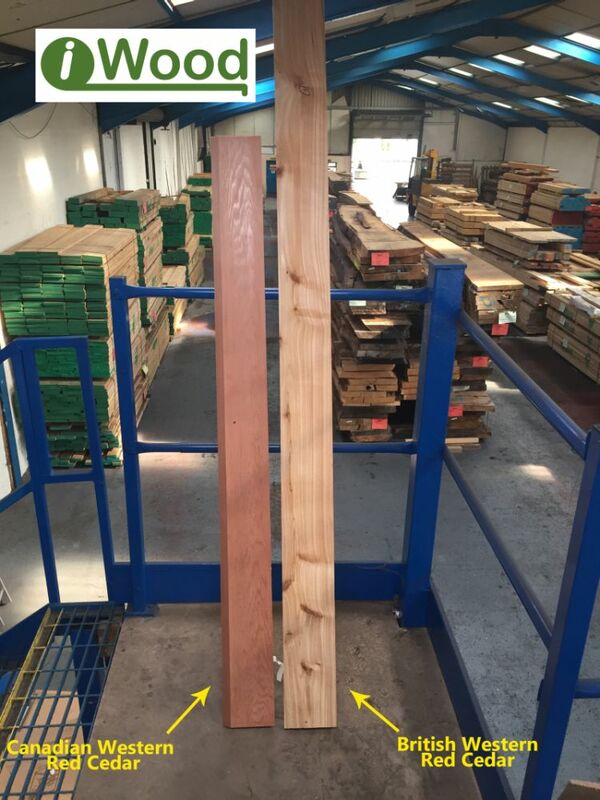 We provide it here in a fresh sawn grade in various different profiles.These British Red Cedar Cladding boards are sourced from various locations throughout the UK. Also see our cedar cladding page for imported cedar. 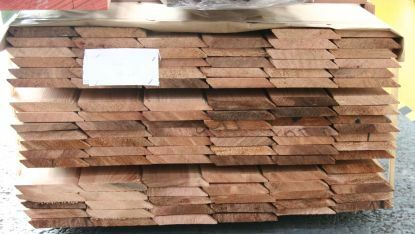 Native-grown British Cedar generally contains more knots than the Canadian / American timber and is lighter in colour. Some architects prefer this as it adds more character to the finished look. Partly because of the lower transport costs, British Cedar costs significantly less than the foreign grown timber. British cedar is rated as moderately durable, which is one notch down from imported cedar's 'durable' rating. All other properties are comparable. Depending on how much direct sunlight the cladding receives it can take a number of years for the reddish-brown fresh colour to fade into the recognisable silver shade. The cladding boards are not treated so you can leave them as-is to weather to a traditional look or apply your own choice of protection. iWood offers 11 different profiles of cedar cladding as standard. There is a variety of machined tongue and groove profiles, a “Rainshield” profile, two Feather Edged profiles and a “one waney edge, one square edge” profile. Although this grade of timber is fresh sawn, it can be machined to these profiles as it is a stable timber. These boards are provided in random lengths of 3m and longer. If you have any questions please call 01889 279 018. Left: This brief video scans across a Western Red Cedar clad outside room. NB: iWood did not supply this project. Above: Red Cedar Cladding board ends in our warehouse.